Zion Market Research has published a new report titled “Colorants Market by Type (Dyes, Pigments, Masterbatches, and Color Concentrates) and by End-Use Industry (Packaging, Building & Construction, Automotive, Textiles, and Paper & Printing): Global Industry Perspective, Comprehensive Analysis, and Forecast, 2017 – 2024”. 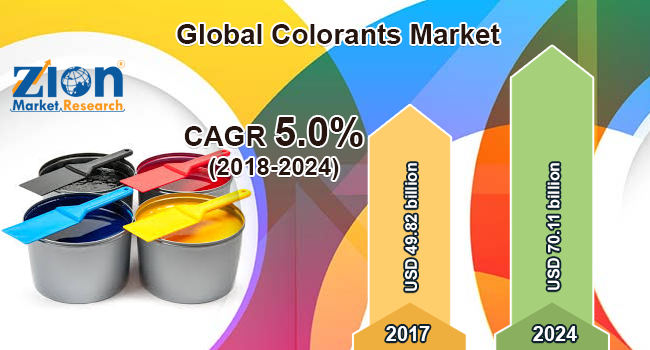 According to the report, the global colorants market was valued at approximately USD 49.82 billion in 2017 and is expected to generate revenue of around USD 70.11 billion by 2024, growing at a CAGR of around 5.0% between 2018 and 2024. The flourishing building and construction activities globally are expected to drive the global colorants market growth over the forecast timeframe. The construction industry uses products that offer high performance in many areas along with being corrosion- and weather-resistant, durable, safe, heat stable, environment-friendly, and cost-effective. Dye and pigment colorant solutions are used to meet these needs. Organic and inorganic pigments are used in many applications, such as recycled products, wood stains, industrial coatings, adhesives, construction sites, dust-abatement tackifiers and polymers, foam and fiberglass insulation, and polishing compounds. Furthermore, the growing housing activities indicate the level of construction activity. As more homes are built, the demand for modern and innovative construction materials increases that are anticipated to the drive colorants market in the future. The construction sector and construction activities are major sources of development, economic growth, and economic activities. Construction and engineering services play a major role in economic growth and development. Increasing demand for paints and coatings coupled with growing construction activities globally is expected to drive the colorants market growth during the estimated timeline. Rising spending on homes for renovations, home improvements, and remodeling is expected to positively impact this market in the upcoming years. By type, the colorants market is segmented into dyes, pigments, masterbatches, and color concentrates. Pigments are expected to witness significant growth over the forecast timeframe, due to the rising demand for pigments in paints and coatings applications for building and construction and automotive industries. The use of pigments is also increasing in printing textiles due to the growing trends in the fashion industry, which, in turn, is expected to positively impact this market. By end-use industry, the colorants market has been segmented into packaging, building & construction, automotive, textiles, and paper & printing. Packaging accounted for the highest revenue share in 2017, due to the increasing use of colorants for coloring plastics for packing various products. Colorants enhance the products’ visual and aesthetic appeal. Pigments, color concentrates, and masterbatches are widely used in plastics, which are expected to positively impact the market in the future. North America, Europe, Asia Pacific, Latin America, and the Middle East and Africa are regional segments of the global colorants market. Europe held the largest revenue share in 2017, due to the increasing customer demands for naturally extracted color additives and supporting legislation promoting product use in varied sectors. The Asia Pacific is expected to witness significant growth over the estimated time period, as the region is a hub for food and beverages, automotive, and healthcare industries, which, in turn, increases the demand for advanced packaging solutions and drives the region’s colorants market. Some key players operating in the global colorants market include Pylam Products, Sethness Products Company, Jagson Colorchem Limited, Teknor Apex Company, PolyOne, Sensient Technologies Corporation, GNT Group San-Ei Gen F.F.I., Inc., Lanxess AG, Penn Color, Chr. Hansen Holding, Clariant International, DD Williamson, Symrise AG, T.H. Glennon, and ROHA JTT Group, among others.